Massaging babies not only feels great and builds a bond, it increases their immune system, aids with gas and digestion, stretches their spinal cord from being in fetal position and helps them sleep deeply. A simple and gentle 3 minute clockwise abdominal massage has been known to give relief of abdominal discomfort. Gently bicycling the knees towards the belly for 3 – 5 minutes helps flush the abdomen. Place a warm heat pack or hot water bottle on the baby’s abdomen (below the ribs) and gently vibrate for 1-2 minutes maximum. Must be at least 30 seconds. Bottle fed babies – add 2-3 drops of hemp oil in their bottle. This is a mild laxative. Nursing moms – Ingest 1 tsp per day up to a maximum of 1 tblsp. This is a mild laxative so adjust dosage accordingly. 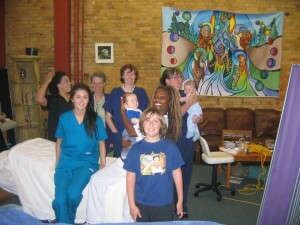 Learn about infant massage in private sessions for parents or in a group session. Private infant massage for mothers with their baby – $45/ 30 minutes.